Is geared for those 16+ who are Green Belt to Black Belt. This class is best suited for a student who has been promoted to the Adult Advanced program (from Adult Beginners program) or a student who has prior training and accomplished a Green – Black Belt. This class is high energy and fast paced in order to maximize optimal training time and focus on advanced technical skills. These adults love the challenge and especially enjoy the fact that they can maneuver their bodies like Martial Artists. They bring a confidence that drives each member of the class to perform at their best and are really able to enjoy everything that Taekwondo offers. A class that has the best attitudes of any program in this universe! 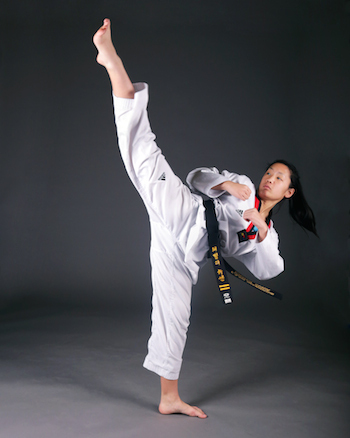 These very open-minded individuals have a passion for Taekwondo and a strong appreciation for Martial Arts. They enjoy quality training and excel in a motivating and hard working environment. Our Adult Advanced are like a big, big family who enjoy training together, sharing stories, laughing together, and motivating each other to be their best. We could not ask for more out of such a wonderful group.